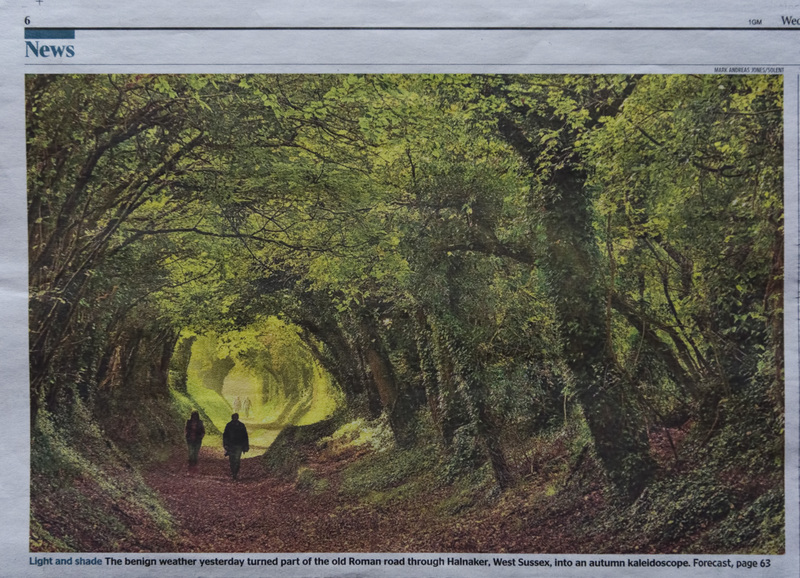 A year ago, shortly before we moved south into West Sussex we spotted an image in The Times newspaper of an old Roman Road at Halnaker near Chichester in its Autumn colours. The image was dramatic and exciting. I cut out the image and filed it away as a place to visit next Autumn (now the current one). The newspaper image is shown below. Yesterday, the weather was perfect and we drove down to Chichester and located the start of this walk, just north of Halnaker on the A285, at the entrance to Warehead Farm. A short walk of less than a quarter of a mile leads into an ancient Hollow Way roofed over by trees – physically a tunnel. Initially the tunnel did not seem to live up to the expectations provided not only by the newspaper image but by others I had seen on the internet. Undeterred, I was frequently stopping to capture images. And then one of those bizarre serendipitous moments happened that are so unexpected. What were the chances of that happening? His name is Mark Andreas Jones (see by-line at top right of the newspaper image). He’s a professional photographer from Hampshire with an impressive website with a link to a gallery of superb landscape images on 500px. Click here to visit Mark’s website. We chatted to Mark who told us that the colours were not as good as the previous year (so I wasn’t imagining it). His image had been taken using a long lens to create compression. I had brought a modest 16-85mm zoom (equiv to 24-127mm full frame) and my wide-angle lens. Not the best gear for the occasion. We walked on up to the top of the hill to see Halnaker Windmill sadly without its sails (or sweeps) removed for repairs, from which there were panoramic views to the north, and to the south to a huge stretch of coastline. Walking back down, Mark was still where we left him, still patiently waiting for potential images and we carried on down the Hollow Way. Meanwhile I had switched to my wide-angle lens sensing that a wider view of immediate surroundings might be the way to capture something worth while – so far I had nothing that satisfied me. I let my wife walk ahead following her closely, the sun being almost straight ahead. There were occasional patches where light was filtering through, highlighting my wife’s hair, and the pictures started to come, close to the point where the tunnel ended on our way back out. My two images are at the top of this post and below. Some of you may be wondering what a Hollow Way is and how they were formed. We have been familiar with Hollow Ways in and around our old village in Northants which was once on the edge of a major forest centuries ago. The logging out of wood from medieval forests with cart horses is one of the primary ways in which these ways were gouged out. I found that quote included in an article on a website named ‘Caught by the River’. click here to go to the full illustrated article. Yesterday will linger in my memory for a long time, with particular thanks to my wife for her inquisitive thinking. And there will be return visits to this spot. It is well worth a visit on a fine day. This entry was posted in Landscapes and tagged Halnaker, Halnaker Hollow Way, Hollow Ways, Mark Andreas Jones. Bookmark the permalink. It looks beautiful there. “Green roofed tunnels” is an apt description. Thank you for sharing! Many thanks for your comment and visit, Wayne. Thanks Sue. It’s getting a little late in the season now for a visit, particularly with the change in the clocks. There wasn’t a lot of light spilling into the Way, but we were there about 2.30pm and the light may be better in the morning when the sun will be to the side of the Way (it runs roughly NE to SW). Certainly well worth a visit – take a long lens and a tripod, you will probably need to wind the ISO up a bit. I was originally disappointed as I couldn’t seem to get the exposure right due to the high contrast been shadow and light and the problems was accentuated by having seen quite a few high quality images on the Web (as well as Mark’s), and feeling that I wasn’t getting anywhere near that sort of shot. It was on the way back out that I started to ‘see’ potential images. The light had changed slightly, and my wife was walking in front and I followed her quite closely watching for the next pool of light to backlight her hair. And then the images started to come. I’m so glad you persevered, because the two you showed us here are stunning, Andy! Thank you – when the sun is rendered like that, it is always a bonus. We in the West and Mid-west portions of USA have our own version of Hollow Ways. We call them Swayles. They are ancient paths followed by the Indians (the first known human inhabitants of the North American continent.) Our Highway 36 follows much of the orginal trans-continental pathways from Maryland to California. West of Missouri, we can still often see the roads (ruts) left by countless wagons as people moved to better or free land to homestead or to search for gold and other precious metals in California, New Mexico, Oregon. These often are less than two hundred years old but they pass for ancient here. Thanks for your interesting notes. This Hollow Way may well once have been a Roman Road which means that this route might date back as far as roughly 2,000yrs. And that really is ancient. What a place! Thanks for taking us there. I wonder how that place sounds like. Is it quiet or full of subtle sounds? The stillness is powerful and quiet. Great stuff, stuff dreams are made off. 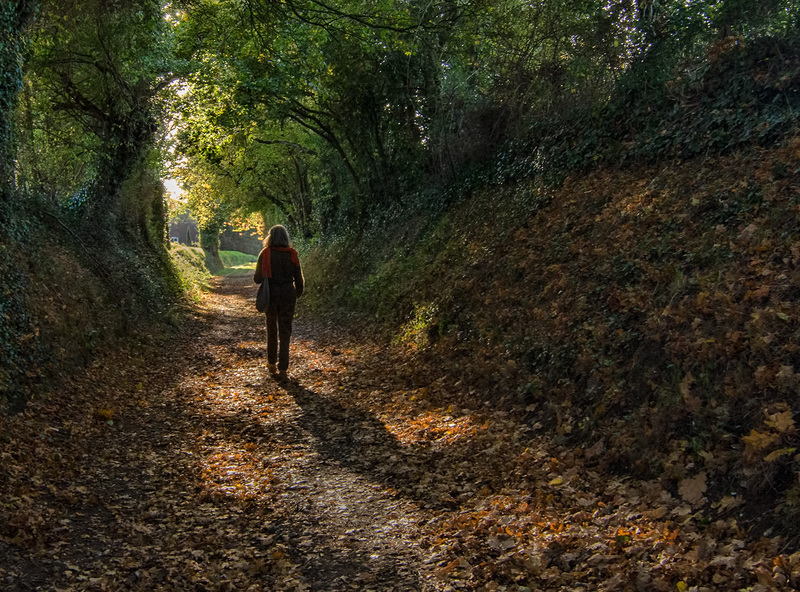 I loved learning about the Holloway – a concept that just isn’t like on our side of the pond, we haven’t been walking the same paths for as long. And it’s cool that you met the same person who took the photo that sparked your interest. Your photos are lovely – every day is different, every year is different, right? Thanks Lynn. So true – no two days are the same, there is always something new to see, and the light changes. What treasures: your photographs, the one that inspired you, the photographer of the original image, your wife’s inquiry, the story about hollow ways (which I’d never heard of) . . . Congratulations on a great post, Andy! Thank you so much Linda. Yes, it was a day to remember although I still want that special ‘shot’. I think that may have to wait until next year but I will be back. I love Holloways and everything about them – how wonderful that you have discovered one. I was aware of the MacFarlane book a couple of years aga via the Caught by the River website – adorned by the artwork of Stanley Donwood. Magical places. Thanks Meanderer. 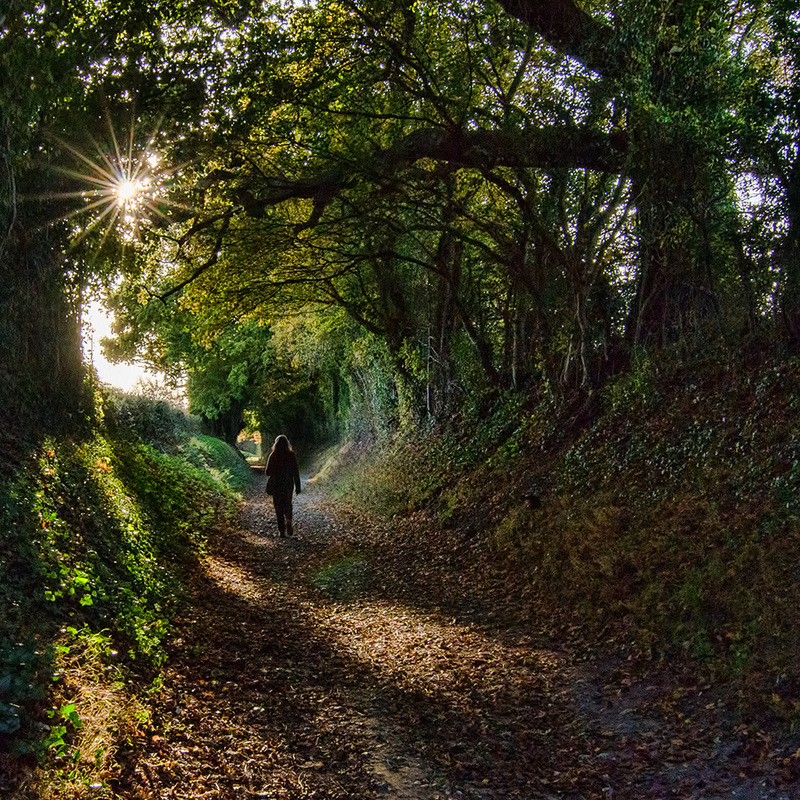 We were aware of Hollow Ways because our village in S Northants was once within the confines of the Whittlewood Forest and some of the local narrow country roads are classic Hollow Ways. In one instance, the existence of a recognizable Hollow Way was successfully used to refuse a planning application for a significant new estate as it would have resulted in the uprooting of the banks of the Way. I have read two of Robert MacFarlane’s other books; ‘The Old Ways’, and ‘Mountains of the Mind’. He is a brilliant and evocative writer who really brings the landscape to life. Nice shot and fabulous coincidence. I can see the attraction of this Hollow. I hope conditions are better next time you visit. Many thanks for you comment LD. One of the benefits of the Photographic community of which we are both members, is that we get daily opportunities to see, and be inspired, by each others work. 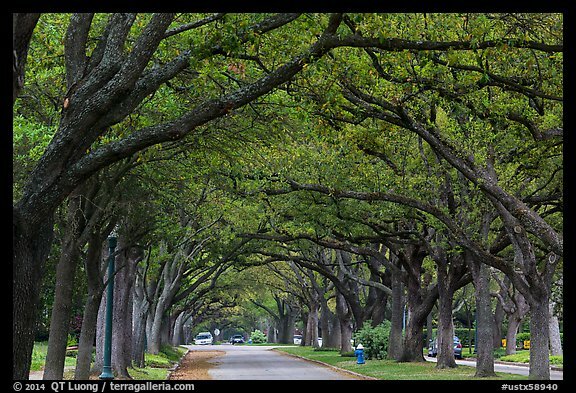 What your photo does remind me of are the “tree tunnels” created in Houston where live oaks of great age branch out and over the streets. This is an example from one of my old neighborhoods. It’s not as old, and not as romantic, but we make do as best we can. It was a wonderful bit of serendipity to run into the photographer who had so impressed you. I’m glad he confirmed that the color wasn’t quite what it had been. That had to have helped assuage your disappointment. Sorry for the delay in replying, somehow your comment got placed in the ‘Spam’ folder. I’ve seen some wonderful ‘tunnels’ on images from plantations (in the Carolinas) I think. When I was a child we sometimes drove home from church through a tree tunnel that was known (not sure who by, or whether it was just Mum and Dad’s idea) as ‘Under Heaven’. I’ve always been impressed with these tunnels. We now live in an area of England that is heavily forested and there are lots of examples – even on the main roads – where tree branches have grown over the road. Thanks Adrian. The ‘lone figure’ (aka my wife) will be pleased to read this comment. Eventually I found what I was looking for! Many thanks for the mention in this list.